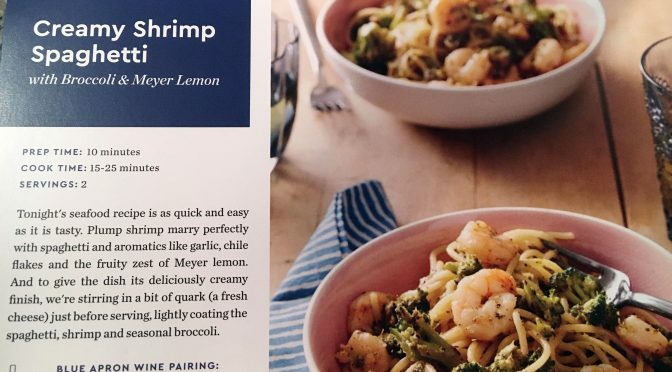 This is my third Blue Apron recipe but out of the three I have cooked so far, the Creamy Shrimp Spaghetti with Broccoli & Meyer Lemon recipe has been my favorite and easiest! 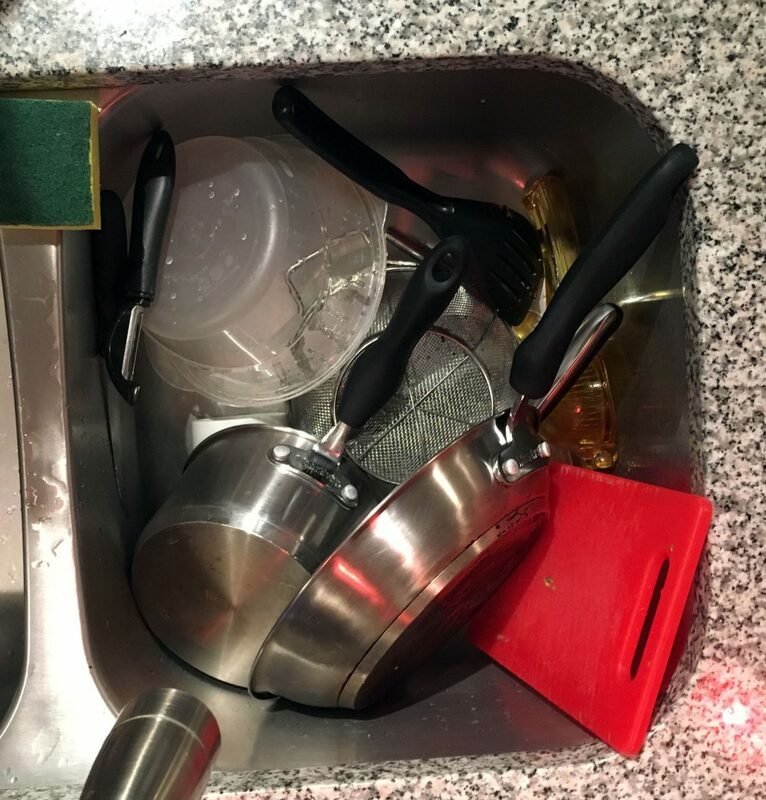 If you want to check out my first experience with Blue Apron, read my first review. In case you missed it, I don’t get paid to write these reviews. In fact, I am a terrible cook and I find pleasure in terrifying my family. The look on their faces when I am in the kitchen – priceless. 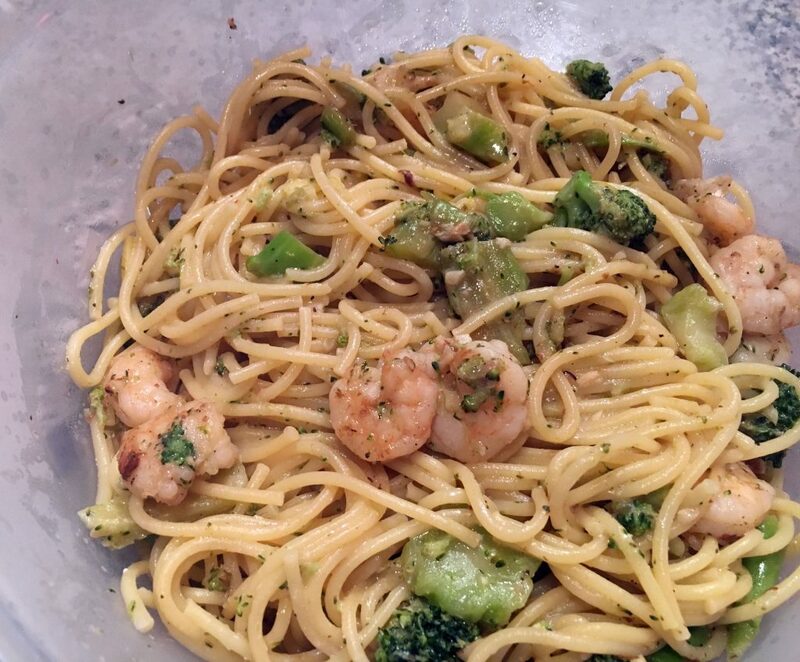 Spaghetti, shrimp, broccoli, Meyer lemon, garlic, butter, quark, crushed red pepper flakes. 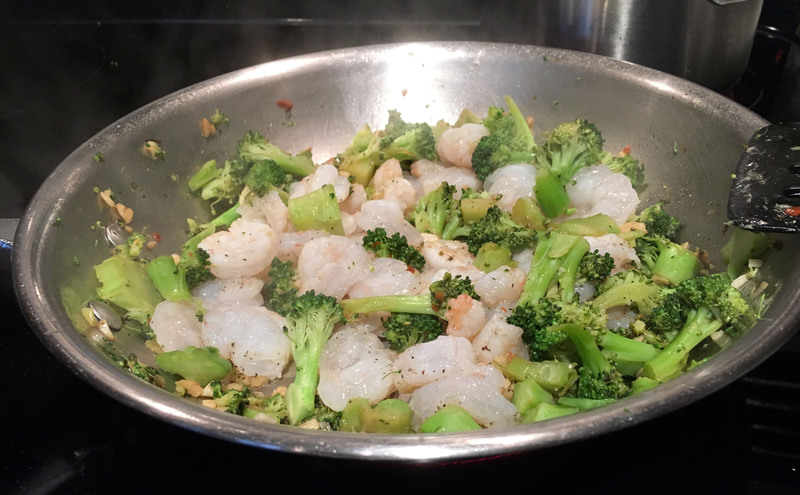 I chopped up the broccoli and because I was so excited (and hungry) to start, I forgot to include the shrimp and the Meyer lemon in my pic below. *The quantity of the spaghetti didn’t seem to be a lot, but it’s definitely more than enough for 2 people. And geez – now that I am looking at the picture, I forgot the garlic, too. So SUPER simple, except when it asked me to remove the yellow rind of the lemon but to avoid the pith. I am not sure what the pith is… the “pith of hell”? What would happen if I didn’t avoid the pith? The recipe did suggest the use of a zester, but I don’t have a zester. This was my attempt at zesting and avoiding the dark pith of hell. My poor lemon….my MEYER lemon looks butchered. My attempt to create zest. I have heard of Meyer lemons before but thought it was a name brand like “Dole”, but it’s not. There are some differences between regular lemons and Meyer lemons. Check out this link if you want the whole skinny. Apparently, they are seasonal and only available between December through May. 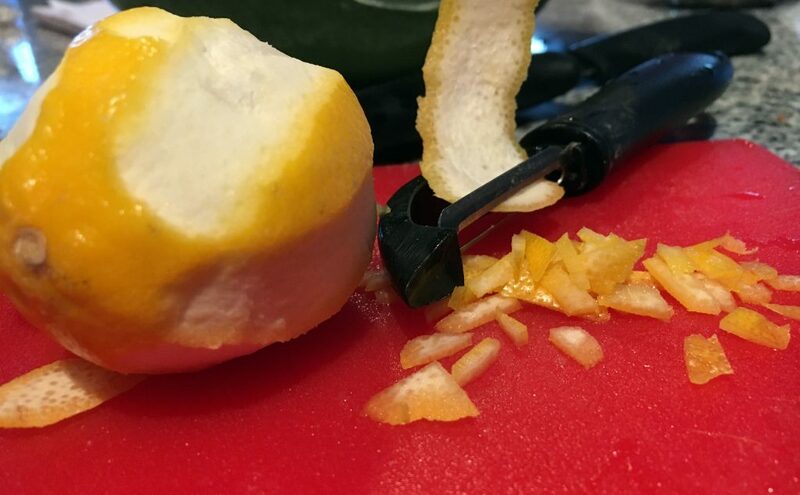 I’m glad it’s February, otherwise I might have never had the opportunity to meet and butcher a Meyer lemon and the pith of hell. 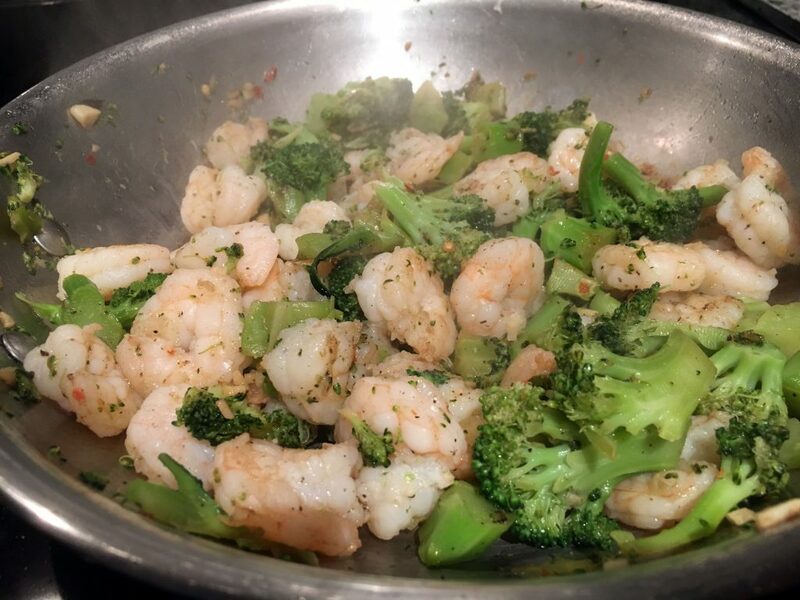 After I got done zesting up the Meyer lemon, I started to get the water boiling for the spaghetti and roasted up the garlic, some of the red pepper flakes and then added in the broccoli and shrimp. The recipe says to cook the shrimp 2 to 3 minutes or until opaque and cooked through. I wasn’t sure what they meant because the raw shrimp looked opaque to me, but I might have to look the word up. Because I know for sure…that they are raw and I think they want this shrimp COOKED. I didn’t want to be held responsible for any type of shrimp related death or illness, so I was sure to cook them until they were pink. And dammit….I just looked up the word “opaque”. I’ve been wrong all my life. I’ve always thought it was the same as “translucent”. 1. not transparent or translucent; impenetrable to light; not allowing light to pass through. Hot, steamy, opaque shrimp below. I deserve the piths of hell. While all the cooking was happening, the spaghetti was in the background boiling away. A few times, I stopped to check it and really wanted to throw it on the ceiling to see if it was done. We used to do that in college to see if the spaghetti was cooked. If you throw the spaghetti (not all of it) and it stuck to the ceiling, it meant that it was done. This wasn’t my idea, but I went along with it. By the time the year ended, we had to scrape a lot of spaghetti off the ceiling. After I was sure that the shrimp was OPAQUE and the MEYER lemon zest and juice was added, I added the quark cheese and the cooked spaghetti. (I don’t really want to get into “quark” cheese). 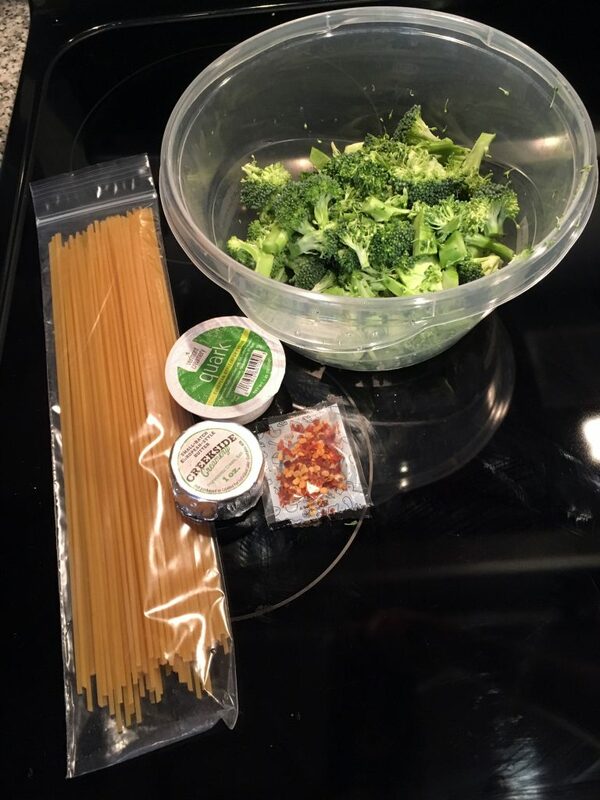 Here is my final Blue Apron Creamy Shrimp Spaghetti with Broccoli and Meyer Lemon. Loved it! I didn’t take note of the time it took to prep and eat, but was less than 1 hour. Amanda wasn’t around to eat it for dinner, but she took it to work with her the next day for lunch. No one died or got sick. “Day After” Rating – Amanda “really liked it”. This is a good thing. I think next time I cook this, I will NOT put lemon or Meyer lemon zest in it. I don’t think I zested it correctly because it was way too bitter.